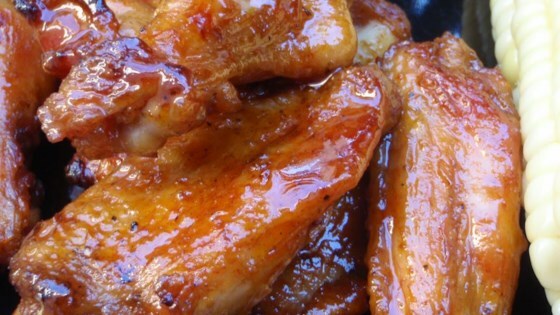 "A sweet, spicy wing recipe that is amazing on the grill! This is a Detroit recipe, so enjoy!" Wash the wings well and pat dry with paper towel. Season the meat with cayenne, salt, and pepper. Cook the chicken wings on preheated grill until cooked through and juices run clear, 20 to 30 minutes depending on the size of the wings. Brush the wings liberally using 1/2 cup of honey while they are cooking. Melt the butter, pour into a large bowl and mix in the remaining 1/2 cup of honey and hot sauce. Remove the wings from the grill and immediately toss them in the hot honey butter sauce to coat. Serve the wings 'wet' or return them to the grill for 1 minute per side to set the sauce. Sweet, spicy and delicious wings perfect for any Sunday football game! I baked these at 350 for about 50 minutes (my oven doesn't get that hot though). Honey goes well with the hot sauce. I will make it a little hotter next time! My husband made these last night on his own. He cooked them in the oven, 425* for almost 45 minutes. This recipe is one of the best wing recipes we've ever had. Absolutely delicious! I added minced garlic. Possible to use half the honey and still get the desired level of sweetness. Often requested at the fire station.